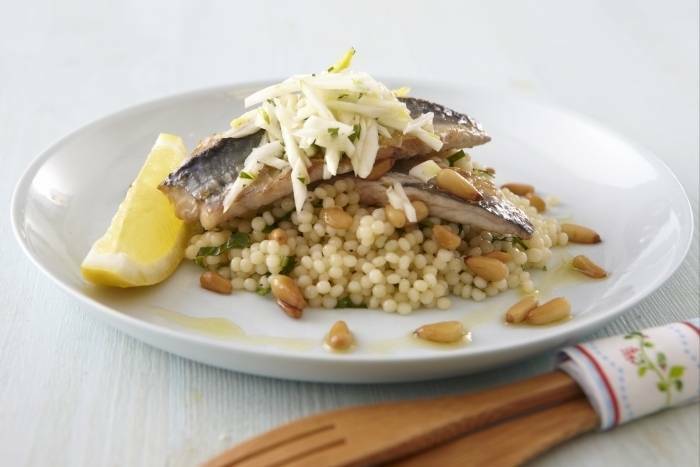 Fresh mackerel fillets pan fried and served with giant cous cous or 'baby pasta' and a wilted fennel salad. Season the flesh side of the fish with salt and pepper. Heat a non stick pan, add a drizzle of olive oil then add the fish skin side down. Cook for 3 minutes until the skin is crispy, turn the fish over in the pan, add a squeeze of lemon and allow the fish to finish cooking with the residual heat in the pan. Bring a pan of water to the boil, add the giant cous cous and cook for around 8 minutes until 'al dente'. Drain and then season with salt, pepper and olive oil. Meanwhile, slice the fennel finely on a mandolin, add a generous pinch of salt and allow the fennel to wilt. Chop the parsley. Zest and juice the lemon. Toast the pine nuts in a pan for around 2 minutes until golden brown. Pulse the pine nuts in a blender. In a bowl, mix together the cooked cous cous, 3/4 of the fennel, lemon, parsley and pine nuts. Check the seasoning. Reserve the remaining fennel to garnish the plate with. Place the cous cous in the centre of the plate using a rectangular mould. Top with the mackerel fillets, dress the plate with the juices from the fish and finish with the remaining wilted fennel.